Why it is important to have your Last Will and Testament prepared by an experienced probate attorney verses doing it yourself. While you are not legally required to hire a lawyer, it is strongly recommended. Have you ever heard of Abe Lincoln’s statement, “He who represents himself has a fool for a client,” or have you ever heard of pulling your own tooth out with pliers instead of visiting a dentist? We can say that we have seen avoidable and unfortunate situations in our 100 years of combined legal practice. The purpose of a last will and testament is to safeguard your assets and make sure your property is protected for your family and heirs. It is one of the most important things you can do for your loved ones, so why would you put that in jeopardy by self-preparing your Last Will & Testament? It often pays to spend the money on a probate attorney who is thoroughly familiar with states laws and regulations, and who can also help guide you with the emotions that often come with planning a Last Will and Testament. The drafting of a will involves making decisions that require professional judgment which can be obtained only by years of training, experience, and study. Only the practicing lawyer can avoid the innumerable pitfalls and advise the course best suited for each individual situation. In addition, an experienced attorney will be able to coordinate the use of other skilled professionals, such as an investment advisor, actuary, insurance specialist, and tax accountant to complete a proper estate plan. 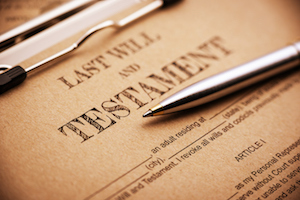 Let’s face it, a last will and testament takes time to organizes and the decision can be overwhelming. One cannot underestimate the risks of an improperly made power of attorney or estate plan. Let an experienced lawyer review your particular circumstances and help you ensure that your wishes are clearly, properly and legally documented for them to be honored later on.